Guests will often ask for recommendations on what they should do for an afternoon. Realizing that I always recommend the same spots and routes, I think it’s time to put it in writing! The Inn is centrally located, so walking is always the easiest and fastest way to get around. When guests want to get out and explore with no real plan, I always point them to the Boston Public Library in Copley Square. Less than a 10 minute walk, it’s an easy way to get started in the city. The Dartmouth street entrance brings visitors into Charles Follen McKimm’s 1889 Bibliotheque Nationale inspired building. A grand and beautiful Renaissance style structure awaits book lovers and tourists alike. 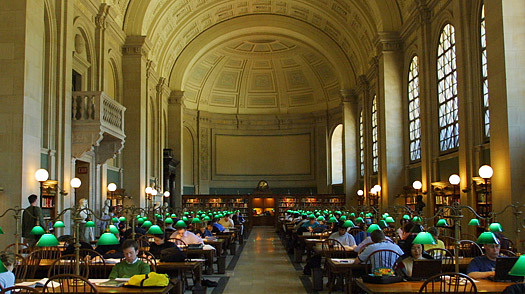 The Bates Hall reading room is why I send everyone. An incredibly expansive and light filled room with a heavenly vaulted ceiling, visitors will find this quiet space loud with visual delights. From the book lined walls, to the streaming sunlight, to the rustic wooden tables and their charming green glass lamps, this room is something to feast on. But be quiet! It’s one of the last respites in the city where a ban on talking is enforced. After you have been wowed with the reading room and the gorgeous marble staircase and frescoes, it’s time to head downstairs to the other best kept secret of the library; the courtyard. I think of it in terms of Frances Hodgson Burnett’s The Secret Garden. A lovely, hushed open-air space filled with greenery and italicized with a spritely fountain – enclosed by elegant loggias – this secret city garden must be contemplated. City sounds are removed and running water and the wind’s breeze becomes the soundtrack of your day. It’s magical. Now that you have refreshed your mind and body, it’s time to head back outside and continue on. A quick tour of Trinity Church is always recommended as it’s across the street from the library. But if that doesn’t strike your fancy, there’s always the The Oak LONG Bar + Kitchen at the Fairmount Copley Plaza. After drinks and bites, it’s time to get shopping! Continue north on Dartmouth to Newbury Street. There are goods and services for every price point, with stores from Tiffany & Co. to TJ Maxx. 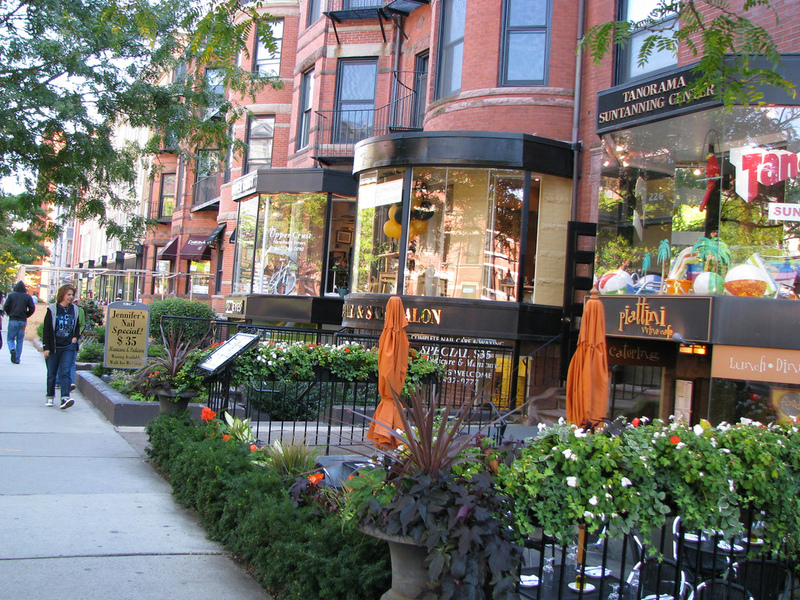 I always tell guests to start on the east end of Newbury facing the Public Garden to get your fill of luxury shopping. Then walk west towards Mass Ave and find more low to mid priced vendors. With the mix of local boutiques and chain brands, the choices are endless! If shopping is not your interest, you’re in luck! One block up from Newbury is Commonwealth Avenue. Modeled on The Avenue des Champs-Élysées in Paris, this grand boulevard has a gorgeous city park nestled between two lanes of traffic flanked by some of the most gorgeous townhouses in Boston. If you want storybook Boston, this is it. Stroll east towards the Public Garden. If you are here in spring or fall, then you are in for a treat. Cherry blossoms and tulips decorate the garden when winter breaks. Canopies of yellow, red, and orange foliage greet you come autumn. 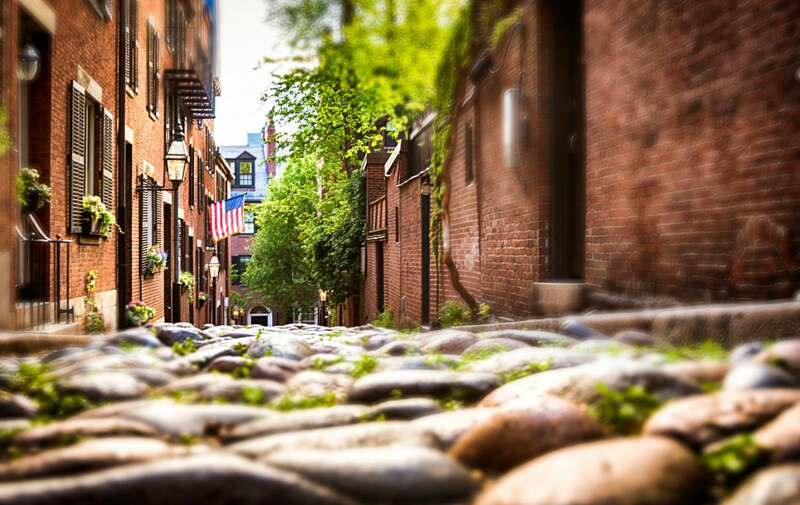 Meander east through the garden and you will find yourself on Charles Street. Take a left and follow into Beacon Hill. The cobblestone sidewalks and Federal and Georgian style architecture is enough to charm anyone. But the lovely local shops and restaurants are what make Charles Street so lovely. I highly recommend stopping in at Eugene’s Gallery. This intimate one woman show of a vintage print shop is the definition of charming. Barbara, the proprietor, reigns over an extensive collection of antique prints primarily showcasing the Boston and New England area. You can choose an inexpensive lithograph and work with Barbara to customize the framing to create a museum worthy piece. It’s incredible! There are countless options for how to spend an afternoon in Boston. 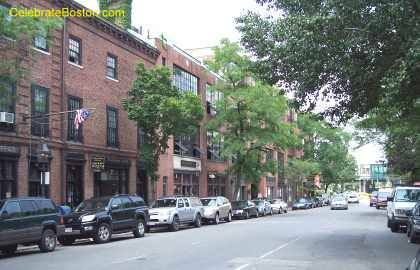 But this walking tour shows off some of the best of Boston. Get out and enjoy!